There’s a little-known tool in PowerPoint called the selection pane. 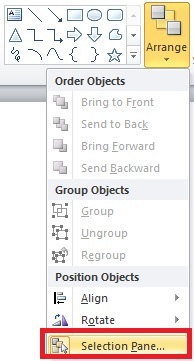 From the Home tab in the Drawing group, locate the Arrange drop down button. Choose Selection Pane at the bottom of the list. The order in which the objects are listed is also the front to back order of the layers. The top most item is at the top of the “stack.” The little eye icons on the right of each layer will make it visible or hide it. This makes it much easier to work with multiple objects that are layered on top of each other and revealed by animation. In 2010 and earlier, you’ll find re-order arrows at the bottom, so you can adjust where an object appears in this layering order. 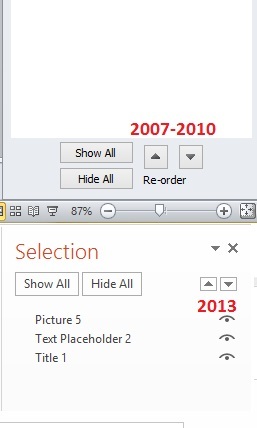 In PowerPoint 2013, you’ll see the unlabeled arrows at the top (black triangles). Using these arrows are the equivalent of right clicking an object and choosing Send Forward or Send Backward. Another great feature of the Selection Pane is the ability to rename these objects. Picture 1, Group 2 and Text Placeholder 4 are great if you only have one of each type of object. Name them descriptively to work with your objects without guessing which one is which. Just single click on the object name in the Selection Pane and type the new, more descriptive name. Is Google+ still a thing? Excel Error Messages Part 2: When is an error not an error?